James Wallace (1872-1911) was a landscape painter from Berwick on Tweed who later lived in London and Paisley and who painted many scenes around Berwick on Tweed. 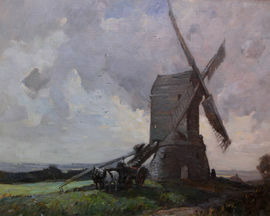 Exhibited at The Royal Academy between 1899-1904. Exhibition history Royal Academy 2, Glasgow Institute 5, Royal Scottish Academy 5.